"Having now adjusted back to reality ... a very big thank you to you and the team for a really great time last week - it was brilliant ! "You have a great team and special thanks must go to Patrik who was an excellent guide and to Abdeljallil who was always there when help was needed - with a big smile - both were most enjoyable company and the evenings were really good fun. 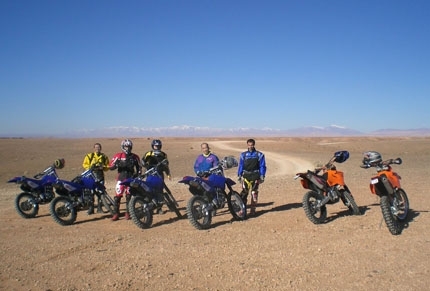 "The routes were excellent with some amazing sights and great riding and I loved the KTM. "In terms of accomodation I particularly liked the atmosphere of the auberges at Tamaloute and Erg Chebbi - and Tenerhir was a good venue for NYE with the party and Zagora good too.